Today, turning on the 3D building layer in Google Earth will show you both 3D buildings contributed by users via our 3D Warehouse, and also photo-textured buildings that we’ve modelled to really bring Melbourne to life in Google Earth. Get a preview of the experience by checking out the cool fly-over video below. If you'd like to take a crack at modelling a building for Google Earth, the tools are free and everything you need to get started can be found here. As inspiration, look at the amazing things ZNO have done in Christchurch, New Zealand. If you haven’t already, download Google Earth 5.0, and fly around 3D views of great cities from around the world, including San Francisco and Christchurch. It’s one of the ways we’re continuing to make Google Earth an even richer experience, with the addition of Street View imagery, historical imagery, and terrain imagery. ​Been to Melbourne lately? If not, it has become a whole lot easier to get your Melbourne fix without jumping on a plane, thanks to recent updates to the 3D buildings layer in Google Earth. that there are reasons for optimism this Christmas: small and medium businesses are showing signs of recovery and consumers are beginning to spend again. To help Australian businesses make the most of the month before Christmas, we're excited to offer a free $100 search marketing campaign for advertisers that have yet to try Google AdWords. This $100 Christmas bonus must be claimed before 31 December 2009 at http://www.google.com.au/stilltimein09. Tens of thousands of Australian businesses already use AdWords and search marketing to reach new customers and drive sales. This Christmas, an online presence will be more important than ever, as a record number of Australians head online to research and purchase their holiday list. In fact, in the month of October, we saw strong query growth in several key categories compared to the same month last year, including apparel (+55%), home furnishings (+64%), restaurants (+44%), spa and beauty services (+57%), and travel (+37%). We're also excited to launch a new way for businesses to understand how people search for and interact with their online business listing. The Local Business Centre dashboard will show business owners information like what search queries led users to the business listing and how many times users clicked through to the business's website. With this tool, business owners will be able to identify trends, such as days of the week when interest in their business spikes, or seasonality in the types of searches that lead potential customers to their listings. The dashboard is accessible to any business owner who has claimed his or her listing in the Local Business Centre. Business owners who do not yet have an LBC account can quickly create one for free by visiting http://www.google.com.au/lbc. You can check out the video below for more information. We hope these tools will help Australian businesses see out 2009 in a strong position, ready to make the most of the opportunities in 2010. We know Christmas is one of the most important times of the year for businesses of all sizes, from retailers to restaurants and travel agents. Though 2009 has been a tough year for many, recent reports suggest that there are reasons for optimism this Christmas: small and medium businesses are showing signs of recovery and consumers are beginning to spend again. , to jump starting ideas for unique Christmas table settings, the web has made becoming a culinary master much easier. We're excited to announce that we've partnered with a number of top chefs and food industry experts to bring you some elegant new, food-focused iGoogle themes and gadgets just in time for one of the most foodie times of the year. iGoogle is all about personalisation and freshness, and in that spirit, these unique themes are sure to delight the chef in all of us. Check out our iGoogle gallery, where you'll find some tasty new themes from chefs like Iain Hewitson and Peter Gordon, food artists like Carl Warner and James Parker, and even famous bakeries like New York City's Crumbs Bake Shop and Magnolia Bakery. In addition to these taste bud tantalising themes, we've also partnered with top food industry names to build a suite of new gadgets for your iGoogle page. For example, Supercook lets you input various ingredients you have on hand, then gives you some great recipes you can whip up — all from your iGoogle page. We hope this new element of gourmet iGoogle personalisation will get you even more interested in enhancing your cooking and dining experiences. Here's to some great new food with family and friends this holiday season! At Google, we're huge foodies, and most of us love spending time in the kitchen with friends and family - especially around the holidays. Particularly during this season, many people turn to Google when searching for recipes - in fact, as you'll see, Australians are searching for recipes more than every country but the US and Canada! But, in addition to spicing up your recipe repertoire, Google can be a really useful resource in the kitchen. From helping you with sugar measurements, to jump starting ideas for unique Christmas table settings, the web has made becoming a culinary master much easier. ", or "homes for rent near perth". The idea is to make it really easy for you guys - you tell us what you want, and we get it back to you! Of course, we'll continue to work to return the best results for all your Google Maps queries, whether you're looking for local businesses, geographic features, or your perfect home. We also wanted to tell you about the integration of real estate listings with Place Pages. Now clicking the "more info" link next to a listing takes you to a faster, easier-to-read page that gives you all of the information we have about a listing: photos, inspection times, videos, details, a Street View preview and nearby public transit information if available, allowing you to quickly find the listing you want and click through to the sources of the listing. We hope you find these features improve your real estate search experience on Google Maps. Around half of the Googlers in our Sydney headquarters are software engineers, working on some really cool things - Google Wave, App Engine, Google Docs, and of course, Google Maps. Recently, some of us have been working on a particularly interesting project that combines Google Maps and search technology - we've been trying to work out if your search query in Google Maps means you're interested in having current real estate listings returned to you. It's nice to get to work on some 'search' engineering down here! So here's what we've been cooking up - in the past, if you wanted to view real estate listings on Google Maps, your best bet was to select "Real Estate..." from the "More" menu at the top of the map. Now, simply searching for "real estate" will return, well, real estate (try it)! You could also try "homes for sale sydney" or "homes for rent adelaide". Or while you're at it, check out "apartments for sale brisbane", or "homes for rent near perth". The idea is to make it really easy for you guys - you tell us what you want, and we get it back to you! Of course, we'll continue to work to return the best results for all your Google Maps queries, whether you're looking for local businesses, geographic features, or your perfect home. One thing that we've learned at YouTube is that sometimes even the most creative and entertaining ads need a little help to go viral. That's why BETC and evian bought YouTube homepage ads in the UK, France, Germany, US, Japan, and Canada to promote their video around the world. These ads, combined with an innovative creative idea, also had a positive brand impact, according to research from Nielsen and YouTube. Specifically, Internet users in France experienced increased brand awareness and purchase consideration after viewing the ad. We always knew that cooing babies were popular videos on YouTube. But apparently roller skating babies are what users around the world love to watch the most. Today, BETC and evian's 'Rollerbabies' film on YouTube were awarded an official Guinness World Record for the most viewed online ad of all time. The video has been watched a whopping 45,166,109 times and is getting more views every day. 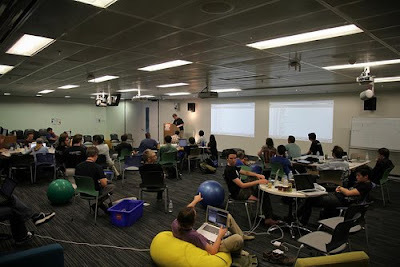 Last weekend, OpenAustralia held its second hackfest at Google's Sydney office. If you haven't come across OpenAustralia.org before, it's a volunteer run website which helps you to find out what your representatives get up to in parliament with the aim of bridging the growing democratic disconnect that many people feel. This time we went all out with a two day hackfest - 10:30am till 8pm both days. That's over 18 hours of hacking! As well as the venue and a fabulous team of volunteers, which included Tim Ansell, James Polley and Pamela Fox, Google provided lunch and snacks for both days. Thank you to Google for supporting this community! It was an amazing turnout by an incredibly talented group of people. Over 90 people took part, including a surprise group from CSIRO who happened to be wandering past and dropped in to see what we were up to. We were also delighted to have 30 people take part in the first ever retroactively-named OpenAustralia installfest - installing the development virtual machine onto their laptops, and walking through the first steps showing how they can make changes to the code, test locally, and then submit to our repository on github. During the course of the hackfest, we had half a dozen or so patches pushed to us - we're still working through the process of accepting them all! We also had 40-odd updates to bugs on our tracker. Photos by Halans. For more fabulous photos by Halans and others see Flickr. 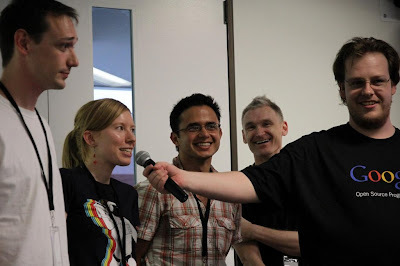 This hackfest was timed to coincide with the Gov2.0 Taskforce MashupAustralia competition, and we encouraged people to work on mashups for the competition, OpenAustralia itself, or any other civic-minded project. At the same time hacking on MashupAustralia on the weekend was the #melbhack session, organised by Lonely Planet and the GovHack folks. If people weren't in the mood for hacking, either on a mashup or OpenAustralia, we had presentations and directed hacking sessions scheduled throughout both days. Plenty for all to do. We gave out small prizes (donated by Google) to some of our favourite mashups created over the weekend. Working demos, however rough, won out over plans, however well-formed. Our favourite mashup, the "Suburb Matchmaker", was created over the weekend by Raul Alberto Caceres (@totocol), Daniela Fernandez (@danira_98) and Roberto Arias Alegria (@roberto8080). It was particularly impressive that this team met over lunch on the first day and decided on the spot to work together. 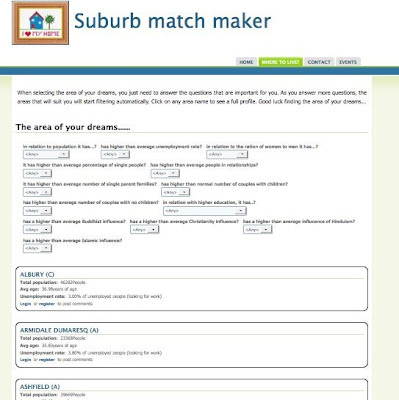 "Suburb Matchmaker" helps you find the suburb that's right for you by answering some simple questions. Second place went to the "Frog Census" by Simon Swain (@psi6030). 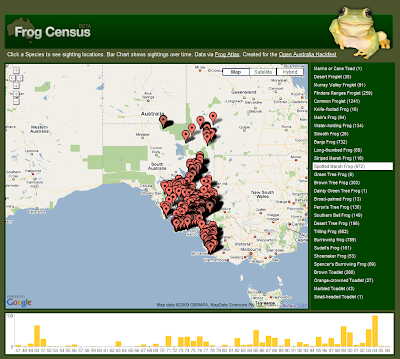 See where and when different frogs have been spotted in South Australia. The irreverant "Bouncing Teapots" by Dan Bethell (@fxmonkeydan) and Ray Haleblian (@rhaleblian) came third. The "Bouncing Teapots" simulated members of the House of Representatives as teapots falling where the more time they spoke in parliament the more bouncy they were. We hope that one of these or one the many other projects that were worked on over the weekend will win the MashupAustralia competition! To follow OpenAustralia's progress and find out when we'll be running the next Hackfest near you please read our blog, follow us on Twitter, Facebook or join our community mailing list on Google Groups! This work, unless otherwise expressly stated, is licensed under a Creative Commons Attribution-Noncommercial-Share Alike 2.5 Australia License. When you're searching on Google, we think you should have the choice to keep adult content out of your search results. That's why we developed SafeSearch, a feature that lets you filter sexually explicit web sites and images from your search results. While no filter is 100% accurate, SafeSearch helps you avoid content you may prefer not to see or would rather your children did not stumble across. We think it works pretty well, but we're always looking for ways to improve the feature. Even from across the room, the coloured balls give parents and teachers a clear visual cue that SafeSearch is still locked. And if you don't see them, it's quick and easy to verify and re-lock SafeSearch. To use SafeSearch lock, go to the "Search Settings" page on Google. For detailed instructions, check out this video. We hope you and your family find exactly what you’re looking for in Google search results — and nothing more. Congratulations to our 2009 Doodle 4 Google winners! From more than 5,500 individual entries, our 32 wonderful winners had first been selected as one of 320 finalists, and then impressed our judges (Ken Done, Anne Geddes, and Hugh Evans) enough to be selected to come to Sydney for a day of Googley fun. Every one of the young artists impressed us with both their obvious artistic talent, but also their wonderful attitudes and interest and passion for Australia's future. They asked fantastic questions throughout the day, as they learned about the history of the Sydney Opera House in a fun behind-the scenes tour; heard from inspiring humanitarian Hugh Evans about his wish for Australia and the world; and saw first hand the way that Google's original doodler Dennis Hwang creates his iconic artworks. Nearly 80,000 Australians voted for their favourite Google Doodles over the last few weeks, and we revealed the winners after a jaunty trip down from Google HQ led by gypsy band Kush. Then came one of the big moments of the day ... finding out which Google doodle would be seen by millions of people around Australia and the world on Australia Day next year. Dennis Hwang, selected Jessie Du's doodle "Australia Forever" to appear on the page, and he complemented her on the real warmth in her drawing. We can't wait to see it on the homepage next year in all its glory - congratulations Jessie. To everyone who entered Doodle 4 Google Australia 2009 - thank you for sharing your talent and enthusiasm with us. Doodle 4 Google is one of the highlights of our year, and you guys really made it special for us. Keep doodling! What an amazing day we had at Google's Australia headquarters on Tuesday. Thirty-two talented young artists from every state and territory in Australia flew to join us for a day of celebrating their achievement at being selected as the winners of the 2009 Doodle 4 Google Australia competition, which asked kids to draw a Google doodle showing their 'Wish for Australia'. that our Street View fleet would be back on public roads across Australia this month to capture new and better imagery of our country's beautiful cities, beaches, and dusty roads. What better way to kick this off than to start with a little fun at our Google Australia headquarters in Sydney? This morning, about 300 Googlers in our Pyrmont office lined the park next to our office to welcome the Street View camera (and get our 15 minutes of fame). When the imagery goes up sometime next year, you'll be able to spot all kinds of props - blow-up toys, signs, exercise balls - and acrobatics - handstands and human pyramids. You may also see a few Googlers trying to catch the car on their scooters. It's become a Google tradition to pose for our Street View cars when they drive-by our offices around the world. For this occasion, we won't blur our faces, though we normally blur faces and license plates in our Australian Street View imagery. For a sneak peak of our Street View shots, check out the photos from our neighbours at the Sydney Morning Herald (you may spot a few of their faces too). We recently announced that our Street View fleet would be back on public roads across Australia this month to capture new and better imagery of our country's beautiful cities, beaches, and dusty roads. , is part of the Smart Online, Safe Offline (SOSO) social initiative from the National Association for the Prevention of Child Abuse and Neglect (NAPCAN). At Google, we believe that education is vital for combating cyber bullying and we're proud to support the SOSO campaign through YouTube. YouTube is a great platform for reaching teens and speaking to them in a medium they understand. It was very impressed to see NAPCAN involve young people in all aspects of developing their campaign. Although we all have a responsibility to prevent and combat cyber bullying, the most powerful impact will come from teens themselves. Online people say things they don't mean. In person, you get reactions and facial experessions. Online you don't get that; you don't have to face them, you can say more extreme things - there are less consequences online but not for the other person. Bullies pick on others to try to feel better about themselves. Sarcasm doesn't sound the same online. Once you write things down, the damage is done. Don't be a keyboard hero! Stand up to bullied online! My message for young people is that you're in control of your online experience. Don't put up with stuff which bothers you - flag inappropriate content if you find it on YouTube, delete comments which bother you on your videos or moderate comments before they go live. You can also disable comments altogether. Think about whether you want to be contacted and by who - you can block this feature altogether or limit to your friends. Keep personal videos private. Check out our Safety Centre - we have lots of practical advice about being safe and making the most of your online experience. Today we hosted the launch of a new campaign to help teens combat cyber bullying. The campaign, called Cyber Bullying Affects Real Lives, is part of the Smart Online, Safe Offline (SOSO) social initiative from the National Association for the Prevention of Child Abuse and Neglect (NAPCAN). As a challenger telco in the competitive Australian market, AAPT has worked closely with Google in the past couple of years to get the most out of the technology opportunities available to us - using search in smarter ways, and using Google Maps and Google Earth when it has made sense as a way to better visualise and plan our operations and communications with customers. These decisions were easy – Google’s technology was leading the way, and we were committed to being at the cutting edge. The decision to ‘go Google’ for our internal IT infrastructure was a tougher decision at a philosophical level than a technical one, because it fundamentally concerned a new way of working within enterprises, but it’s a decision we haven’t regretted. Let me tell you about our journey to go Google. The first, and perhaps most fundamental question we had to answer was around how much control we would have when we adopted more open, social collaborative methods rather than more traditional enterprise methods. The breakthrough for us was in realising that both worlds can exist and people will use the methods that best suit them. With this decision made, we quickly moved on to what the business case would be and what benefits we would gain. Most of the tangible benefits were in the Gmail and storage arena. However, we were rolling out only Google Video and Google Sites in our ‘Phase 1’, with a view that Gmail would quickly follow. We resolved that Phase 1 was “strategic’ (a euphemism for ‘gut feel’) and would significantly contribute to a more engaged (and hence productive) workforce. With the business case approved, we moved into implementation mode. Firstly we had to convince our security guys that we were all still safe, and then we started to tackle the old “single sign on” chestnut, believing firmly that we need to embrace ease-of-use as a core principle for this and many other things. It was a really interesting experience, as along with Google we were really educating our security guys on the robustness and security of the cloud, a new area for them. Next, we moved into the test phase, with about 20 of us. Here, we picked up and solved a few minor issues, such as firewall and monitoring configuration which were pretty confused with the sudden increase in video traffic! While all this technical stuff was going on, we were busy working away on the “how-we-launch” part and what should the landing page should look like. In line with our internal philosophy to keep things simple and straight-forward, we used a basic landing page and worked on the premise that many people were already familiar with the technology and/or it was so intuitive that little or no training was required. We decided a company-wide announcement and restatement of the internal internet usage policy would suffice. Perhaps the hardest part of all was preparing the welcome video for the landing page, as I became stuck in the retake loop and ended up trying to use video editor to tidy it…which then chewed up inordinately large amounts of time. Suddenly, the penny dropped and I realised I had forgotten it was meant to be easy to use and it was not meant to be studio quality. We’ve had loads of videos and sites popping up around all sorts of topics that I never knew about. Personally, I’m sucked in hook, line and sinker with video updates, which are proving a much simpler and quicker way to spread the word (or am I just really saying it saves me writing it down?!). We’re now looking forward to the next stage, which we’re aiming to accelerate into Phase 2 (Gmail). All eyes will be on Flemington racecourse this afternoon, for the 2009 running of Australia's most famous horse race - the Melbourne Cup. It's all about the thrills, the wagers ... and of course, the fashion, which we're celebrating in our special Melbourne Cup 2009 Google Doodle. If Google search trends are anything to go by, fashion generally noses out horses as a hot search topic ... but today wouldn't be complete without them both. Enjoy the day! AdSense for Content delivers text ads throughout News Digital Media sites that are relevant to the audience and content. Small and large advertisers can target News Digital Media sites to connect with the sites' content and traffic. AdSense for Search allows News Digital Media to provide Google web search to its visitors, and to earn money by displaying Google ads on its own site search results pages. Last year, Google's AdSense publisher partners received more than USD $5 billion. News Digital Media is a vital news and content resource for Australians. By connecting News Digital Media’s sites with our vast base of advertisers, AdSense provides an effective and efficient revenue stream for News Digital Media. We look forward to a successful partnership.